"A psychedelic, rowdy anthem for artists, entrepreneurs, and anyone who has ever dared to have a dream." When a group of young DIY artists in Santa Fe can't find a door into the art world, they blow open an entirely new portal with their grit, passion, and tenacity. Within just a few short years - and with a little help from George R.R. Martin - this group called Meow Wolf ultimately hits a cultural nerve and garners massive, unexpected success with their exhibit, House of Eternal Return. Since Factory Obscura's founding in 2017 in Oklahoma City, the Meow Wolf team has served as consultants advisors, and friends, making possible tremendous progress in a short period of time by sharing knowledge and support. 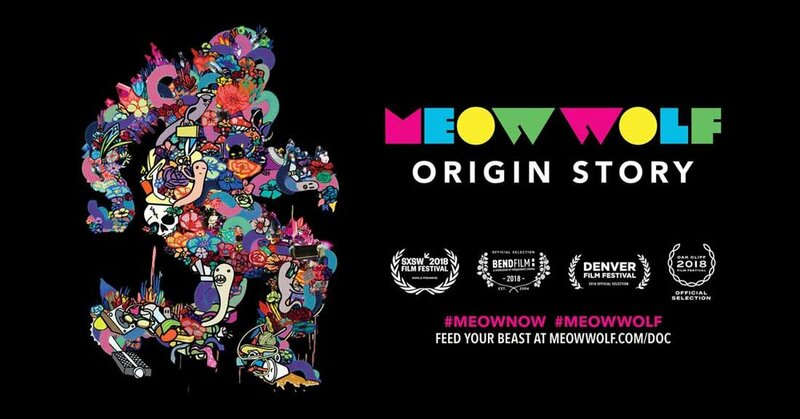 Meow Wolf recently released Origin Story, a film documenting their growth from scrappy, DIY artist collective to contemporary arts juggernaut. The screening will be followed by a panel discussion featuring representatives of Meow Wolf, Factory Obscura, and Ahha Tulsa: Home of The Experience. ALL AVAILABLE SEATS HAVE BEEN CLAIMED! WE ARE NO LONGER ACCEPTING RSVPs. While you're there, make sure to check out the Mix-Tape gift shop, featuring merchandise from Factory Obscura, Meow Wolf, and Flaming Lips. The Mix-Tape Boombox and The King's Mouth experience will also be ready to play!